Arrived after midnight at the hotel, restaurant was opened for us to help ourselves to drinks/bread/cheeses/ cold meats and fruit. Large reception area with 4 computers with internet access which you pay for, 2 massage chairs made an appearance whilst we were there. Safe deposit boxes are in reception area. Our room was basic but it was adequate for what we required as we do not spend much time in our rooms, i emailed the hotel about a week before we went and requested a high room with a sea view and this is what we were given. I think most rooms have a sea view though apart from some of the lower family rooms. We over looked the front of the hotel, i prefered this as the sun was in the room in the morning so cooler when getting ready in the evening, plus you could sit on teh balcony and see people milling around the shops opposite, rather than just looking out over the pool area/sea. No mini bar in rooms. You can put a deposit on the remotes for air con and tv but we didnt, we just stood on a chair to turn the air con on and left it on for 2 weeks. TV we turned channels over on the control panel. Mini golf available, again you have to leave a deposit for the club and balls at reception then you get it back when you return them. Hotel has football/volleyball pitch, tennis courts, ping pong table and a small amusement arcade too. The pool area is fairly large, even if you went down at midday there were always beds stacked up at the sides, the only towel reserving seemed to be for people who wanted the umberellas/shade or the kids pool area so they could keep an eye on their young children. The floor around the pool area is hosed down normally once a day to keep it clean, i didnt see any ants and people always put their litter in bins provided. Once a week they do a themed lunch time event, when we were there it was paella and sangria and another week a BBQ. Lifeguard always on patrol making sure the rules were adhered to. Food was okish... alot of pork is eaten in majorca so this will be on the menu at least once each day.... but plenty of other choice. No air con in restuarant so we used to sit under one of the fans each day. Snack bar is indoors, you cannot remove food from here but its good to get out of the sun each day for a short time. In here they have a small salad bar, breads, burgers, sausages, pasta, spanish omletts, chips/ fruit.. this is open till 6pm. At the bar you have to queue if you want lager. coke, alcohol etc, usually theu will only give each person 2 drinks but they didnt seem to hav a problem giving people 3. All drinks served in plastic cups for safety reasons round the pool area..... they only seemed to give soft drinks in smaller glasses but i started to ask for a large coke etc then they give them in half pint cups. You can help yourself to cool water, orange/pineapple juices / coffee/ hot chocolate from machines. What we did and a few others did was have an empty water bottle and then would fill this up with water, juice etc then have this by you at the pool rather than back and to getting drinks all the time. Entertainment staff had a good selection of daytime activites for all age groups, evening was a bit hit and miss but they tried. The location of the hotel is excellent, if you go down the steps by the lifeguard then turn left this is a short walk to the beach rather than going out of the front of the hotel. Plenty of gift shops opposite hotel, with chemist/ doctors/ childrens play areas with go karts, bouncing castles etc, a few bars and restaurants. What we did was to do a bit each night or we would have run out of things to do. Most of the shops sell the same usual gifts but its worth shopping about if you want a bargin. Hotel staff were pleasant if you made the effort with them as well. i enjoyed the holiday, its very laid back and relaxed, not alot to do in the resort if you want it busy and lively, a bit too quiet for us hence why i wouldnt return to this hotel again. I was nervous about going to this hotel after reading previous feedback...... it takes a long time to get here from the airport when you are doing drop offs along the way, took us about 2 hours. A warm welcome from reception staff and they opened the restaurant for us.. after midnight... so we could have bread/cheeses/cold meats/fruit and drinks.. a nice welcoming touch. The food is what you would expect from many hotels abroad, breakfast, pancakes being cooked on the grill by a chef, the usual bacon/eggs/tomatoes/sausages/mushrooms/ cold meats and cheeses, yoghurts, tons of fresh fruits, tinned fruits/ cakes/biscuits etc. Lunch time you could either eat in the restuarant again the usual aray of fish/meat, alot of pork is eaten in majorca so this is on the menu most days, always something to eat though and a good choice for kids too, in the pool side snack bar they serve salads, burgers, pasta, chips etc. you have to sit and eat this in there but i found this good as it got you out of the sun for a short while. The main restaurant isnt air conditioned so we found it handy to get a table under one of the fans they have... didnt see any flies in the restaurant like previous reports infact i saw 2 all holiday and that wasnt in the hotel either nor did i see many ants round the pool area either. The location is good, we had a room on the front of the hotel, i emailed them about 2 weeks before i went asking for a high room with a sea view and that was what we got. most rooms apart from some of the lower floor family rooms have a sea view, i found it better being at the front of the hotel cos you could sit on the balcony and watch the people below at the play areas/shopping centre as well as see the sea too. plus the sun was only on the room in the morning so cooler in the early evening when you were getting ready. We didnt pay to have the remote for the air con or the tv we found the setting it was at to be ok for us and we could turn the tv over on the display buttons. We hired a safe which are located in reception, better this way as you can keep it until you are about to leave the hotel so not having to have tickets etc with you all day if you are checking out late. Courtsey room is available for guests to use and you can use the all inclusive facilities until you leave the hotel. We found the hotel staff friendly, you needed to make the effort to talk to them though, reception staff very helpful, they have a lady who is english who works on reception too so this is handy if you are having any problems being understood, but we had no problems with them at all. Entertainment staff.... hmm well the day time they had plenty going on, in the evenings its not the best ive experienced, some nights it was poor so we had early nights.. they had the odd visiting act which was good and they have the usual mini disco for the kids for an hr each night, the kids love it. They dont pester you to take part in the daytime they announce what is happening and then walk round the pool area then up to you if you want to join in. While we were there on a Tuesday they did a paella party by the pool one lunch time then on our last day a BBQ so this was a nice change in food and you got sangria too if you wanted it. Theres no rush for sunbeds, you could go down at 12 noon and still have stacks of them at the side of the pool areas, this areas huge and plenty of room for everyone, i would say that if you need to have shade then you are best to try to reserve beds but if you are not bothered about that then no need at all to rush down, i used to go down about 8am and there would be about 3 beds reserved so its nice to not have the manic rush you get in alot of places. The lifeguard is very good too she made sure no people were using hard balls in the pool and no inflatables were used and that no one sat at teh side of the pool drinking drinks, i first thought she was strict but then she makes sure everyone is safe which is what we all want. All drinks are servesd in plastic cups for safety reasons which is good, you will find if you go to the bar to ask for coke /fanta you get it in a small glass so i used to ask for a large one which is a half pint beaker, cos if you are thirsty the small one was going so fast, they had no problem giving you a large glass but not many people seemed to ask for it like i did. What we also did was to have a small bottle of water which we had bought at the airport on our outward journey and then we would fill this up in the hotel to drink by the pool instead of back and to getting drinks, they are happy to fill these up for you or you can do it yourself near the bar, or you can put orange or pineapply juice in if you wanted to but maybe worth doing if you want to take a drink to your room. In all we had a relaxing holiday, i dont think i would visit this resort again as for me and my daughter there wasnt too much going on, not many shops to look round or much to do in the evenings, only a few bars that had tribute acts on or fun nights but not much else to do.... probably better with younger children as theres the play areas to keep them amused. Hotel The hotel is situated off the road with its own area for buses etc to enter the hotel. 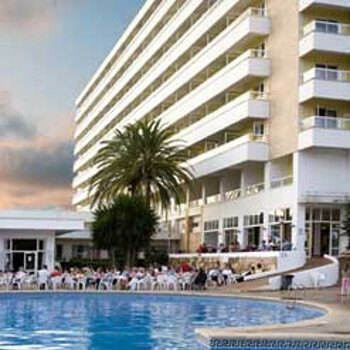 The hotel is situated central to the shops and also a short walk to the beach. Reception area . Quite spacey with several places to sit. Reception staff very helpful. Swimming Pool This is nicely situated and catches the sun all day loads of loungers but the backs cannot be adjusted so therefore quite uncomfortable. Suggest going over the shop and buy cheap airbeds. The bed run starts quite late compared to other hotels and up to 10am you would be able to get space. A life guard is present throughout the day. Bar areas, There are 2 bars open in the hotel one open all day the other opens at 9pm. Bar staff very friendly and tries hard, expect to queue at the bars. The beer/lager at the hotel is quite strong like all the other alcoholic drinks they provide, also a very big local selection of local alcohol. Some nice touches in the bar where they provide slush puppies, tip tops for free. Cold chilled water provided free at the bar and other parts of the hotel. The bar policy is 2 drinks per customer but they will serve you three. Grounds the area is quite clean but suffers from loads of ants in the outdoor entertainment area. The hotel has Tennis courts, a good amusing crazy golf course which is worth a try. The hotel was close to the beach and the shops. It was very clean and the staff were all friendly and helpful. The food was very good quality with plenty of choice. I would reccomend this hotel.The resort has plenty of shops and cafe bars, although we were all inclusive so we didn't eat out. The hotel overall was OK; not the best I've stayed in but certainly not the worst. The food was somewhat repetitive and on occassions bizarre but, if you enjoy peas or carrots at breakfast, that's fine. Although ideally situated for the Cala Domingos beach and with a small selection of shops directly opposite there isn't a great deal else in the area. The entertainment for the children was great; kids clubs, organised games and activities and the very popular mini-disco of an evening. However, I found the adult entertainment sadly lacking. The entertainment programme constantly changed from that advertised and was performed, badly I have to say, by the resort staff. That said, they can't do everything well and they accommodate the children brilliantly. Perhaps the most annoying aspect of the entertainment is that they capitilise enormously on the swimming pool for their activities but then others with kids too big for the baby pool but too small for the deep part of the main pool are disadvantaged, for quite lengthy periods; either that or run the risk of being hit by the 'water polo' teams. The staff, in the main, are very pleasant but there are a couple of horrors. Another annoyance is the fact that, although there is a snack bar service throughout the day, you cannot eat the food by the poolside and don't try to take the food out as the staff will, quite literally, chase you. All that said, the Samoa is an ideal example of you getting 'what you pay for'. i went to this hotel on october 08 i read reviews before i went and i didnt believe what some people were writing about the food and cleaniness of hotel,but when i arrived i was told that my room was a lovely room well if they call that lovely i couldnt imagine there sort of really nice,the food was disguisting always cold if u like fish u would love this hotel,not my cup of tea,their plates were dirty u could still feel and see the previous food on the plates and their cuterly wasnt very clean either.am not thas fussy when a go alinclusive and neither is my sons but none of them could eat the food it was that bad,and for 4 days of the week we were really ill (im no joking)vomiting,stomach pains and dhioreah the worst hotel ever,so please if you are thinking of going to this hotel,PLEASE DO NOT GO)total waste of money. We have just got back from a pleasant week at the hotel Samoa. The bedrooms, although very basic are clean and the linen and towels were changed everyday. The bathroom did need some attention as it was a bit tired and worn but bearable. The food was good. Lots of choice. Good selection of salads, fruit, something for everyone. Only the most fussiest of eaters would go hungry. Some of the soft drinks are watered down in the restaraunt and the coffee is pretty dire. However in the main bars, the staff work very hard and the beer and spirits are fine! The pool was on the small side, particularly for the amount of guests in the hotel. The entertainment was typical Spanish hotel stuff. Overall we had an enjoyable week. A week was enough for us as we would have preferred a larger pool area. A good holiday! We have just returned from a weeks stay at this hotel, I must say I was apprehensive after reading some reports about the hotel, But we had nothing to worry about at all, The place was very clean,some areas though were messy at times, but this is more due to messy people, not lack of cleaning, the rooms were fine,the staff were very helpful and pleasant. The entertainment and sports programme was fine for young children right up to teens and adults, and the entertainment team are very hardworking indeed. The Hotel is also in a good position, being only minutes from the lovely sandy beach. Having read previous reviews about this hotel, I was open minded on what to expect. I thought rival hotels wrote the negative reviews, how wrong was I? Our family arrived at 9pm we were told if we dump our bags in the room and then rush to the restaurant (I use this phrase loosely) we could go and get some food. When we arrived at the restaurant we discovered only scraps of food left. The hot food was cold and tasted disgusting. We settled for a bread bun each to stay on the safe side. On being allocated our room on level 2 down the corridor and then pressing minus 2 on the lift. I knew we were going to what I term the cellblocks below the swimming pool. We were not giving good directions to get to our room and even the lift was out of order. On opening the door to the room we were hit by the heat in the room. We had a quick look around the room before going to the restaurant. Our family (me, my wife and two girls 8 and 7) were staying in the room but the hotel did not have any beds made up for the children, instead I had to look in cupboards and make the beds up ourselves by using the sofa bed. On going to the bathroom I was horrified. The state of the bath was shocking, there was rust in the bath covered by white enamel. There were holes in the tiles where grout had fallen off. The toilet was very unclean, the soil pipe was breaking up and had never been cleaned. On the walls was the same Lino that was on the floor. Before going to the restaurant on our first night we went to the reception and complained about the state of the room. We asked to be moved from it and be put in a room above ground level, as this part of the hotel looked newer. We were told, as we were a large family (2 adult 2 children?) we would have to stay below the swimming pool, as these were larger rooms. They said they might be able to move us to level minus 1 in the morning. We went to bed that night very unhappy.